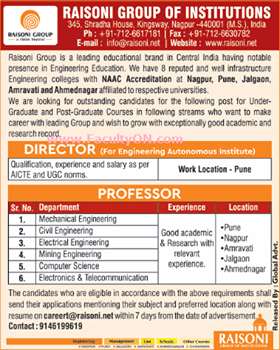 Raisoni Group of Institutions, Nagpur has advertised in the Times of India newspaper for the recruitment of Associate Professor plus Assistant Professor job vacancies. Interested and eligible job aspirants are requested to apply with in 7 days. Check out further more details below. College Profile: G H Raisoni Institute of Information Technology (G. H. R. I. I. T.) is a multidisciplinary amalgamation of fields with pure and applied composition. The institute boasts a bright success story which becomes evident from the way it has expanded its scope. The institute has benefited a large number of students with a technical mindset who have the zeal to excel in the most competent and challenging fields that promote the structure of the contemporary volatile market. It was in 1999, when the institute started execution of the Masters course in Computer Application.